Liquid Silver Salsa is a salsa instructor in Miami, FL, who is globally acclaimed for his unique millennium style. Espinoza was born in Sacramento, California, and he was born to dance! While being raised in Los Angeles, CA, on salsa music, Liquid Silver became an accomplished pop-locker and won several competitions throughout California. Liquid Silver went on to perform in musicals in New York City that featured several of the world’s most recognized mambo dancers. While there, he learned salsa and decided to incorporate his pop-locking prowess into traditional salsa dance. The unique fusion of the two styles became known as millennium salsa and propelled Espinoza to the top of the dance community. Espinoza has since become known for his endless originality. His imaginative and memorable routines incorporate his witty sense of humor and intelligent choreography with highly recognizable characters like Iron Man and King Tut. Since earning his success, Liquid Silver has performed and taught salsa worldwide. He has received several awards and has even judged salsa competitions throughout the world. If you are interested in learning from this impressive and accomplished man, get in touch with us to find out about our salsa lessons and dance classes. 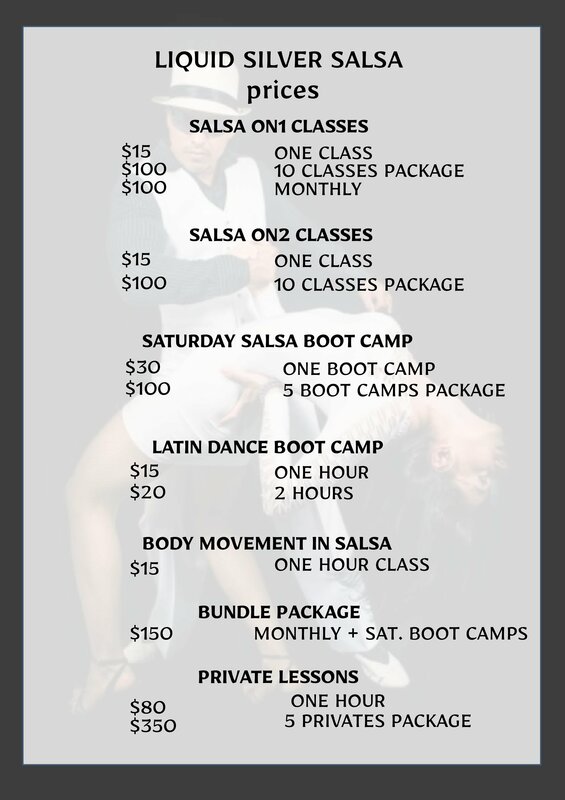 If you want a truly unique and powerful experience, sign up for one of our salsa boot camps.